This issue of Cardiac Electrophysiology Clinics, edited by Drs. 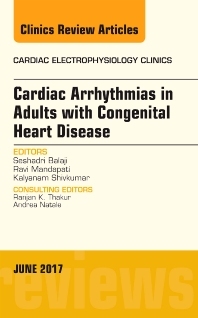 Ravi Mandapati, Kalyanam Shivkumar, and Seshadri Balaji, will cover the latest in Cardiac Arrhythmias in Adults with Congenital Heart Disease. Topics covered in this issue include, but are not limited to Brady arrhythmia; Supraventricular Tachycardia in Adult Congenital Heart Disease; Atrial defects, Ebsteins; Drug therapy; Devices; and Surgery.